An overview of what the bot does - check out the commands page for detailed info about every command. Bender is a bot designed to be flexible - it is highly configurable and balances moderation and fun. It also has unique features, namely editable commands and the ability to use Discord permissions as well as roles for a permissions system. Trusted by over 8750 servers and growing daily. ðŸ’¬ Join Bender's Lair for support or suggestions. ðŸŽ¨ Donate to help keep the project going. ðŸ’Ž Purchase Bender Pro for even more features and commands! 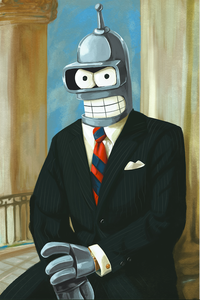 for sponsoring this project and keeping Bender alive! With only a few commands, you can have Bender tell users to agree to your TOS, give them a role while they haven't done so, and DM them with a custom message. Many bots have different commands like !userinfo, !roleinfo, !serverinfo etc. With Bender, you can use any of these, or you can use the info command for all of the above and let Bender handle your input intelligently. Having fun bots makes your server more lively. Bender lets you flip coins, roll dice, play rock-paper-scissors, get roasted by stolen one-liners, and more. With only a few commands you can tell Bender to welcome users to your server, tell them goodbye, and laugh at them when they get banned. You can include the server name, username, user mention, and/or number of server members in these messages as you wish. Ever find yourself using text transfoming sites just to tab back and paste it in Discord to show off your cool Unicodeâ„¢? Or left your caps lock on and cba to type it again? Struggle no more, Bender will change your text however you like it. Keep your chat clean with a regex filter to delete messages and take the action you configure the bot to take. Also has a separate filter for usernames to gracefully remove members with names you don't want to see. If you have users that have paid for a subscription, or you're just forgetful and won't remember to remove someone's role after a certain time, Bender can help you out. Give users a role for any time between 1 minute and 1 year, and you can keep track of when the role will expire. Along with moderation commands, many people like to see logs of who did what and when. After configuring it to do so, Bender will log command usage, edited messages, deleted messages, and moderation actions, from mutes to purging messages to bans. Especially when it comes to moderation, Bender is very customizable. Prevent users from spamming, mass mentioning, using selfbots, and more using the automod features. All features are equipped with settings that allow you to whitelist or "ignore" certain members, and many have additional settings.